To understand what’s happening, we need to first consider where we came from. Let’s back up just a little. 200 years ago these bears dominated western North America. Today they are limited to western Canada and Alaska. Two primary factors have led to this change – hunting and loss of habitat. Both of these factors are still the biggest threats to grizzlies today and in the future. Similar to the fate of wolves (another top predator feared greatly by people), humans aggressively hunted grizzlies resulting in massive reductions in total grizzly bear #’s, and widespread extirpation in many States and Provinces. Driven by fear and in some cases necessity for the safety of settlers and their livestock, hunting was a primary driver of grizzly population change. Habitat loss and degradation followed. The irony of this is un-mistakable. In California, the grizzly is the State’s most enduring symbol known around the world. The bear is central to the State flag, is part of the official Seal, and is the mascot of 3 California universities. The last California grizzly was hunted and shot in Tulare County, CA in August 1922. An iconic symbol in British Columbia and Alaska, the “western population” is Federally listed in Canada as a “species of concern”. Most Canadians don’t realize that grizzlies were once abundant from Ontario to Alberta and that the last prairie grizzly was finally shot in Manitoba in1923. Canada declared them ‘officially’ extirpated in 2012. Times have certainly changed and today hunting is very limited – probably because there are so few bears left – we can’t sustainably take as many as we once could have. Only a few hundred are taken every year – hunting is no longer the big coefficient. So curtailing the Trophy Hunt has moral value for many – so much so it became an election promise in BC. But it’s not what is threatening the future of the species now. The cumulative effects of multiple overlapping land uses combined with significant natural disturbance and climate regime changes are the fire burning at the cave door today. And the reality is most people are not even aware of it. That needs to change if we are going to keep ursus arctos around. Let’s take a closer look at British Columbia. 1. Movement Barriers created by transportation corridors - Major highways break up travel and migration corridors effectively isolating individual population units. Currently between Kamloops and Golden and excluding local traffic, 9,000 vehicles/day travel the Trans Canada Highway (TCH) in the summer – over 1,000 per day are trucks. According to a recent Cumulative Effects study on the twinning of the TCH (Wilson 2017), traffic is expected to double in the next 50 years. 4-laning construction will make travel at higher speeds safer for people and will eliminate platooning which currently creates gaps in traffic where wildlife can cross. Potential Mitigation – underpasses and overpasses similar in density and size to the 38 crossings over 81km highway through Banff National Park. 2. 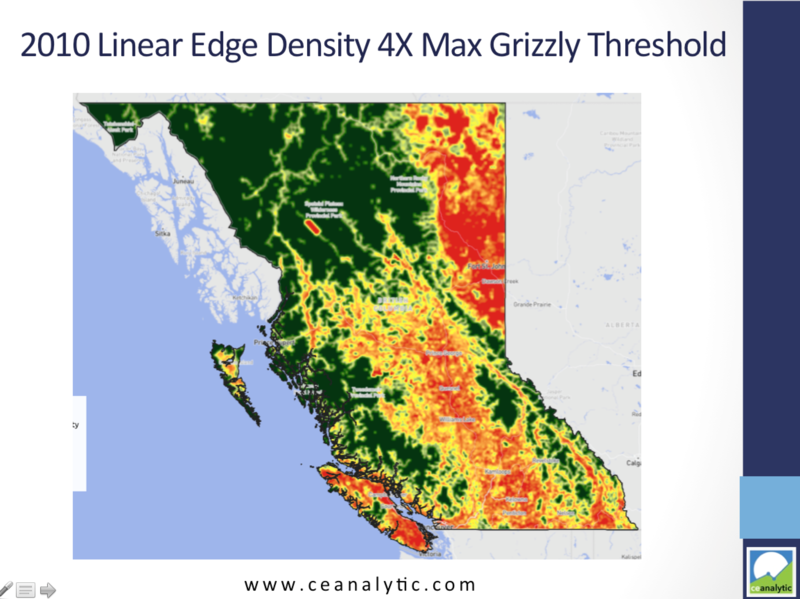 Linear Edge Density – in 1999, the BC Ministry of Forests and the Ministry of Environment, Lands and Parks recommended an upper threshold of linear edge density for Grizzly Bears of 0.6 km/km2. Beyond this threshold, populations will become increasingly vulnerable and less viable. In addition, the negative effects are most pronounced within 500 m of a linear feature. Today about 44% of BC is within 500m of a linear feature. And about 50% of the Province is at or above the maximum threshold. Without mitigation, as we continue building roads to access timber and minerals this risk will continue to climb. 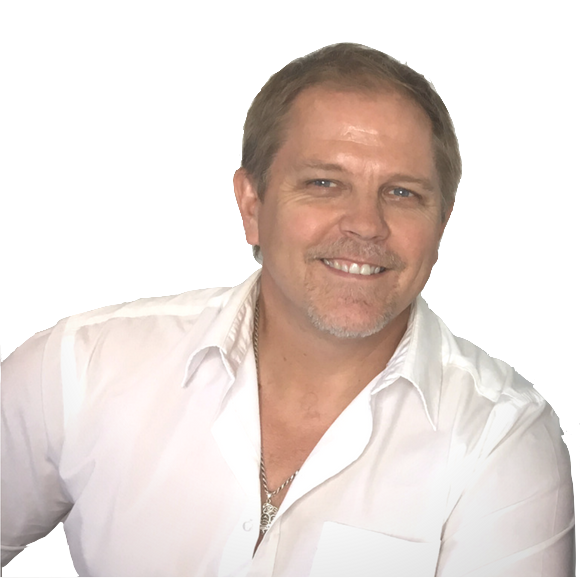 Potential Mitigation – access management. 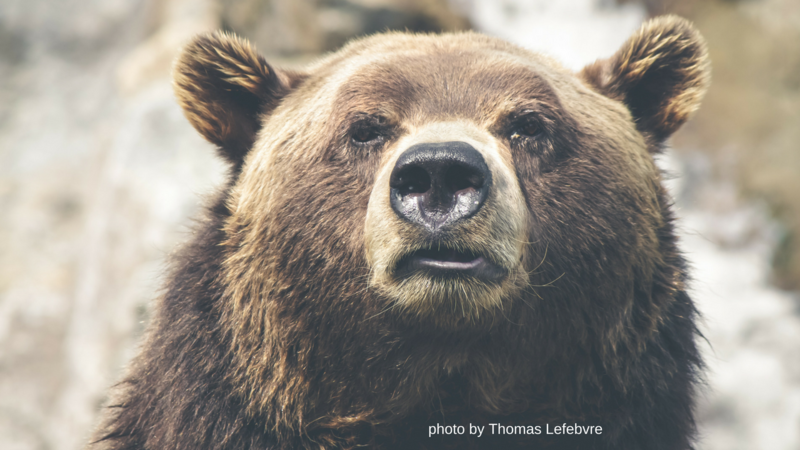 It is not the road feature that causes problems for grizzlies – it’s humans using them. Access management holds great potential for reducing the harmful effects of this footprint but is currently not practiced widely on BC public lands. 3. Loss of Wildfire – across most of BC’s forest and grassland ecosystems, wildfire has historically been the dominant natural disturbance agent that kept these ecosystems healthy and prime habitat for grizzly bears. Since 1950 humans have aggressively suppressed wildfire to protect human lives and infrastructure. Of most significance is the almost complete removal of frequent, small, low intensity ground fires that maintained the dominant forest canopy. Today in BC, 92% of all wildfires are contained within 24 hours. In the naturally fire dominated ecosystems of southern BC humans have reduced the fire rate by 86%. Unfortunately, this has resulted in the fire suppression paradox where our efforts to reduce risk have actually increased the risk of catastrophic events or years for wildlife and humans. Potential Mitigation – prescribed fire and fuel management. “Fire Smarting” communities and acreage interface areas along with the safe re-introduction of fire to the ecosystem through prescribed burning are recommended by many fire ecologists in BC. 4. Avalanche Control - Avalanches are inconvenient for human ground transportation systems and they can be very dangerous for back-country tourists. So humans use a number of methods to detonate explosions in avalanche country bringing down the snow preventing builds up that results in avalanches. The problem is, avalanches create avalanche chutes – which happen to be some of the most valuable grizzly bear habitat in mountainous areas. By preventing avalanches, we are also reducing the creation of this valuable habitat element for grizzly bears. Potential Mitigation – rather than preventing avalanches we could take measures to reduce the risk they present for people and infrastructure. Constructing more avalanche sheds would protect transportation infrastructure and still allow avalanches to occur. Simply enforcing reduced seasons in the backcountry when avalanche risk is high would eliminate the direct risk to backcountry users. This would likely result in some declines in local tourism revenue. 5. Declining Salmon Populations - the relationship between salmon and grizzlies bears is as tall and deep as BC’s forests and mountains. Reductions or in some cases the complete absence of this crucial food source brings significant stresses on grizzly bears. If I Google “effects of declining salmon on grizzly bears” I get 417,000 returns. In some of the best remaining major grizzly habitat in BC within the Columbia Watershed, dams on the Columbia River have ended the great salmon runs of the past. Declines in all wild salmon populations in the remainder of the Province’s river systems are well documented but still inadequately understood. Potential Mitigation – salmon recovery strategies are being developed and implemented but seem to be having limited success and seem to be primarily directed at increasing stocks for human consumption – not for bears. 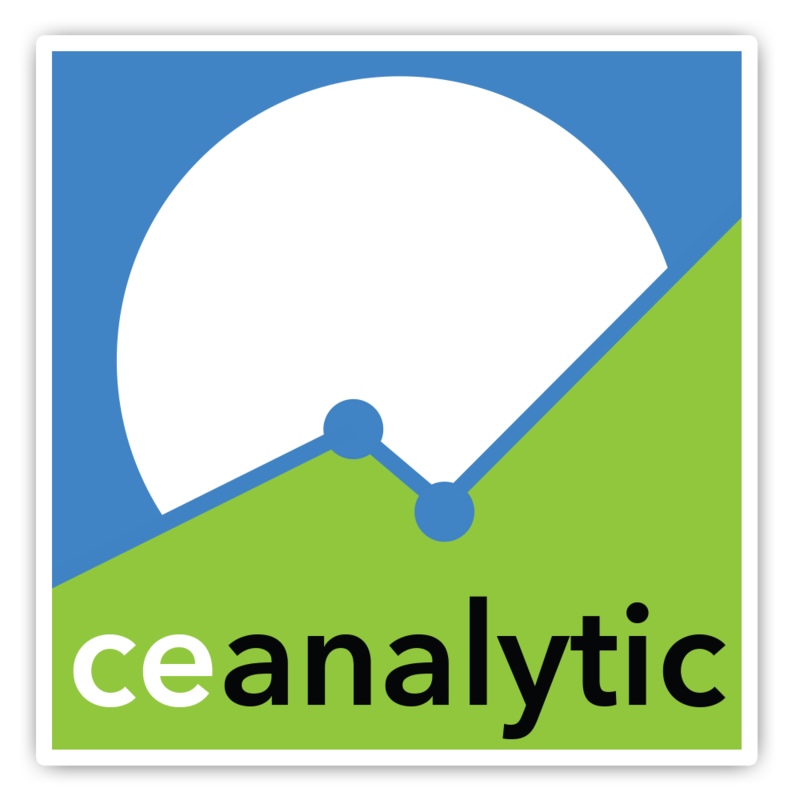 The cumulative effects of human land and marine use on these species are clearly a major factor and deliberate study and quantification of these factors is needed sooner than later. Oh, and now there is climate change, which is shifting the timing of the seasons and precipitation patterns. In most of BC we expect climate change to bring warmer summers, wetter winters and earlier springs. What effects this will have on grizzly denning habits, foraging and reproduction are unclear. Perhaps the bears could easily adapt to climate change if they weren’t already being pressed so significantly by all these other factors. You can learn more about this by watching my 5 video webinar on Cumulative Effects and Grizzly Bears at no charge. What are your thoughts on Grizzly Bear management?